I'll use this page to point out some of the more notable ideas I've incorporated into my -3B and, also some of the products I've used that I think other builders might be interested in. I did a page like this for my RV-8 project and it was a very popular feature. That page can be seen here. Any opinions expressed are strictly my own. I do not accept advertising or subsidies for this site of any kind. Although I prefer a vernier cable for elevator trim adjustment I was sort of forced to design an electric trim solution. It was a bit challenging because the RV-3 was never designed for electric trim and has no provision for it at all. The whole story can be found here. While I don't mind the idea of manual flaps, my interior design required that I get rid of the flap handle, which means converting somehow to electric flaps. All RVs have electric flaps now but I thought my retrofit of electric flaps would be of interest to other RV-3 builders and therefore worth noting, click here for the full story. 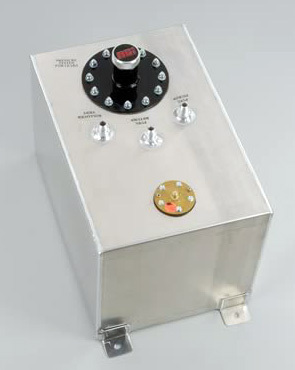 If you are building an RV-3 I recommend you not mess with the aluminum cowl cheek extensions. 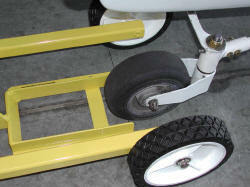 Use the aluminum parts as molds and make the parts you install out of fiberglass. It's easier than it sounds, details here. After much head scratching I ended up using a gas strut to retain the canopy, the full story here. While the RV-3B's wing tanks of 15 gallons each (30 total) are a step up from the old 23 gallon fuselage tank, they still don't provide the range I'd like to have sometimes. Also, I'd like to be able to enter the AirVenture Cup race and be able to run wide open for the full distance. All the RV-4 drivers with their 32 gallon capacity report they can't make the distance running flat out. After considering several methods of providing additional fuel capacity I settled on the use of a removable aluminum fuel cell in the baggage compartment just aft of the seatback. The system begins with a specially configured Andair fuel valve with a position for the aux tank (from AppAir), yet makes the aux tank removable so I'm not carrying around the weight of the tank when not in use. I bought the fuel cell from Summit Racing and built in mounts for it so it can be quickly installed or removed. The fuel and vent lines to the baggage area will be permanently installed with fittings near the tank that can be quickly attached when the tank is installed. These automtove fuel cells are made in a variety of capacities. I selected 12 gallons as a good compromise between weight and capacity. The 12 gallon capacity yields 72 lbs of fuel plus the weight of the fuel cell (~10 lbs). Calculations on a W&B spreadsheet show that this weight in this location allow me to stay within the CG window, but of course I'll need to test this once the plane is completed. In terms of cruise distance, 42 gallons total capacity at 7 gph, which my IO-320 should be able to do easily when leaned out, will provide 5.5 hours with a 30 minute VFR reserve. Assuming a cruise TAS of 175 mph this should yield a max cruise distance of 962 sm which allows me to make SoCal from my home in the Portland, Oregon area no problem. This system will result in about a one pound increase in empty weight of the aircraft when the fuel cell is not installed (the weight of the fuel and vent lines plumbed back to the baggage compartment), which will be 99% of the time, yet let me do the "special events" I want. More pics and info as I get the system installed. Here's a real timesaver... a pre-contoured canopy latch handle. As you builders know, Van's provides an aluminum blank which you must contour if you want it streamlined at all. It can take forever and is easy to botch in the process. 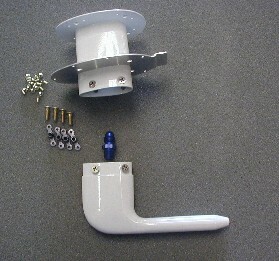 As with most of these sort of solutions, this handle is manufactured by some enterprising RV builders and can be found, along with some other neat widgets, at www.rivethead-aero.com. 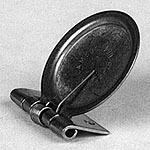 Van's standard pitot tube design, while certainly simple, just doesn't seem durable enough for me, not to mention a bit aesthetically challenged. Also, it bothers me to drill that fairly large hole in the spar cap, it can't be good for the strength of the spar. With the escalating prices of the AN-type pitot tubes I was pleased to discover this aluminum pitot tube option from Evan's Aviation Products. It puts the tip of the pitot tube in the same place as the Van's design for accuracy and comes powdercoated with all necessary hardware. 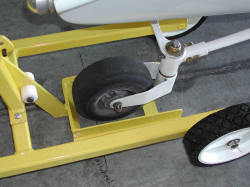 Many builders forget to provide a method of checking tire pressures with the wheelpants installed. 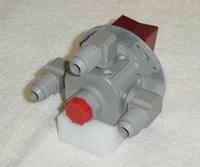 One common technique is to use those hole plugs made of either metal or plastic that clip into the hole. They work but chip the paint after repeated removal/installation. 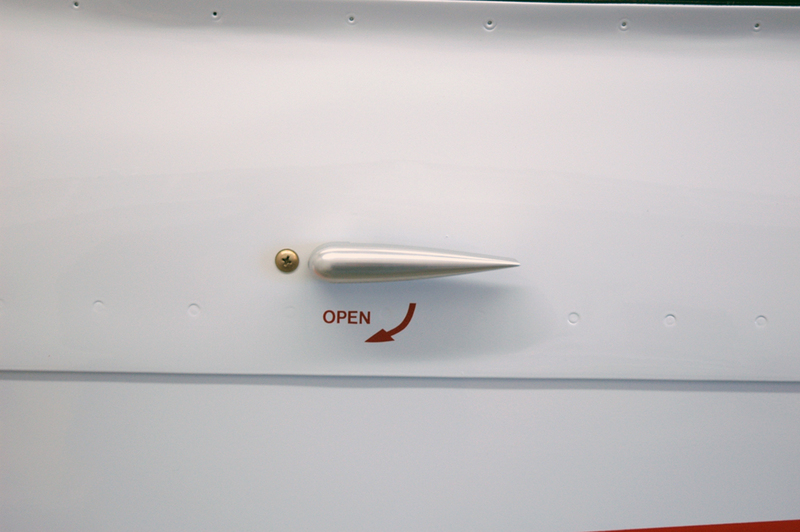 I think a better idea is these little spring loaded doors available from Aircraft Spruce p/n KM713-16-064. Put them in when you build the wheelpants and paint them with the wheelpants and they're barely visible. 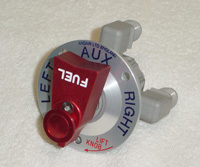 I've installed them in both my RV-8 and RV-3 and they work great. When checking tire pressures just stick your finger in the hole and move the plane a bit to feel when the valve stem comes into alignment. Then use a 5-6" valve stem extention to check/adjust the pressure, voila. 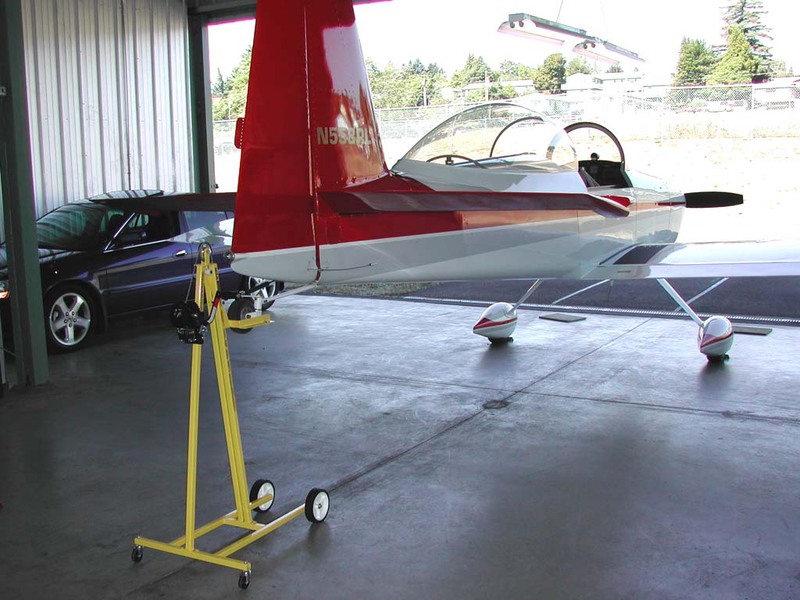 Like many RV builders, local RV-4 builder Brent Anderson just couldn't bring himself to put Van's screen door chains/springs on his tailwheel. So Brent went to his drawing board and designed a better solution which he calls "Tail Lynx". They are all stainless steel, less draggy, much better looking, and the springs are engineered to provide just the right feel on the pedals — not to tight and not too loose. They're available through Van's, for more info click here. In all, a very elegant solution, thanks Brent! 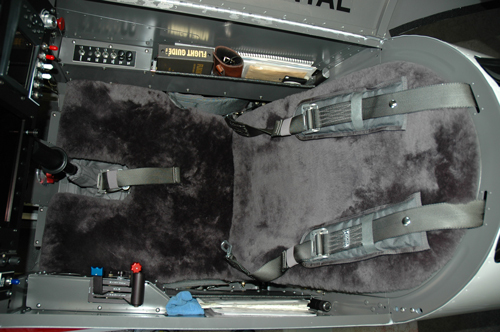 Once you've spent any time flying on an Oregon Aero seat you will never be happy with anything else. 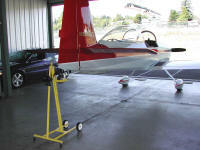 I upgraded the seats in my RV-8 to Oregon Aero, that story can be found here. Regarding covering material, I discovered the comfort of sheepskin, in both hot and cold weather, in my glider and now wouldn't consider anything else. There's a reason why this is what the military specifies for all their long distance aircraft, I highly recommend them. They also made the leather stick boot for me. The single most important aspect of flight planning is weather management. That means being as aware as possible of the weather picture along your route of flight and then making smart decisions about your flight accordingly. After years of visiting lots of weather sites I discovered Weathermeister.com. My normal flight planning process was to use either general mapping software, such as Microsoft Streets & Trips, or AOPA's flight planning software to do my route planning (distance, time, waypoints, etc. ), then hit the list of several weather sites. Before Weathermeister.com it was actually a fair amount of work to hit all the sites needed to assemble the full picture of weather for my route. Weathermeister.com assembles all the data you need from many of the same sources I was using separately, then adds additional functionality with its Flight Optimizer. Frankly, it is so easy it makes me feel guilty! Yes, it's a subscription service with three pricing levels to choose from, but frankly I think it's free. Here's the logic... XM Weather on my Garmin 496 is $49.99/mo, or $29.99 for the Aviator LT package. I changed my subscription from the full package to the Aviator LT package saving $20/mo, then sign up for Weathermeister.com at $6.95/mo and I'm still $13 a month ahead. What I'm missing in the air is primarily winds aloft and satelitte mosaic. Winds aloft is not usually accurate, and with an RV you can just change altitude quickly to check winds anyway. My EFIS has a real time wind direction and speed arrow so I don't even need to compare TAS to groundspeed, just look at the arrow direction and windspeed. I've found the satellite mosaic product (cloud cover) is of little value since it doesn't show cloud tops... can I get over it or not? It doesn't tell you. For me using Weathermeister.com before I take off and XM Aviator LT in the air and is both cheaper and yields a better quality briefing. I haven't done justice here to all Weathermeister.com can do so be sure and click on the logo for a full description. As most folks over 50 know, your near vision usually starts deteriorating as you age andyour eyes become less flexible. Technically it's called presbyopia. After a lifetime of 20/10 vision it happened to me too. While still better than 20/20 at distance, my FAA medical now says "Must have available glasses for near vision" right in the Limitations box. Fortunately there's a good solution, AvSun Readers from www.airplanethings.com. They are regular bifocal sunglasses except that they locate the bifocal line lower than normal so it doesn't interfere with your vision out the windshield or when landing. They work great and I keep two pair in the cockpit, one pair of sunglasses and another pair with fully clear lenses for night flying. My advice, go for the classic aviators pictured here, their new titanium frame versions don't fit as tightly to your face and don't have as large a field of view.